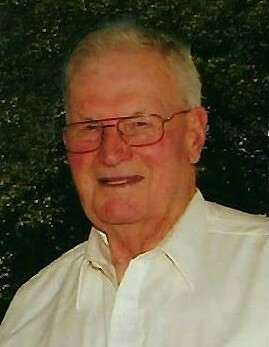 Harold R. Johnston, age 96, of Gladstone, passed away Wednesday morning, January 16, 2019 at Christian Park Healthcare Center in Escanaba. He was born on October 31, 1922 in Sault Ste. Marie, MI, the son of William A. and Isabel (Rodgers) Johnston. Harold grew up in the Soo and was a 1940 graduated of Sault Ste. Mare High School. On August 1, 1941, he served his country in the U.S. Army Air Force during WWII until he was honorably discharged on December 14, 1945. During this time, he was a navigation pilot and was on the Air Force Boxing Team for 3 years. After returning home, Harold attended the Michigan State Police Academy. He was employed as a State of Michigan Trooper for 2 years in Kalamazoo and Paw Paw, MI area and proudly wore his #67 badge. Harold then went to work in the construction business and was a member of the Operating Engineers. In 1967, he moved to Escanaba to be the business agent for the local Operating Engineers #324 for 5 years. Harold went on to be a master mechanic in the union until his retirement in 1986. Harold was involved for 65 years with the union. He was a member of the Escanaba Elks Lodge #324 and also a member of the Operating Engineers Local #324. Harold R. Johnston is survived by his wife, Patricia Johnston of Gladstone; son, David “Gut” (Julie) Johnston of Escanaba; granddaughter, Taylor Lee Anne Nordman; and one great-grandson, Charlie. In addition to his parents, Harold was preceded in death by his daughter, Camie Lee Johnston on October 4, 1987. Visitation will be held from 2:00 p.m. to 3:00 p.m., Monday, January 21, 2019 at the Anderson Funeral Home in Escanaba. Military Honors will be conducted at 3:00 p.m. in the Anderson Funeral Home Chapel by the Delta County Veterans Council assisted by the Michigan Army National Guard. A luncheon will be served at the conclusion of the services in the Anderson Funeral Home fellowship area. Burial will take place in the Gardens of Rest Cemetery.